July 29th 2016: Jaswant Jee, it's been 3 years since you departed this physical world on July 31st 2013. No words exist, to express our gratitude for everything you did for us and the doors you opened for us. We miss you every day. You live in our hearts. This website is a humble attempt by S. Jaswant Singh Ji of California, USA, for most part, to bring out some of the mystical messages of the holy book Shree Guru Granth Sahib that in particular is revered by Sikhs. The word Sikh translates to Seeker / Disciple / Student / Learner. It is, by no means, intended to be the final word on the subject nor does the author holds any such claim. It is open for expansion and modifications. All sincere efforts in this domain are welcome. 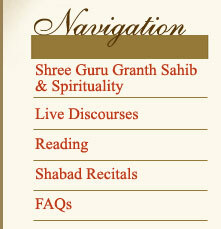 Current content consists of live recordings of discourses by Mr. Jaswant Singh who lives in Southern California. All material provided on this site can be downloaded, reproduced, and distributed without any restriction, so far the material is not altered in any form.